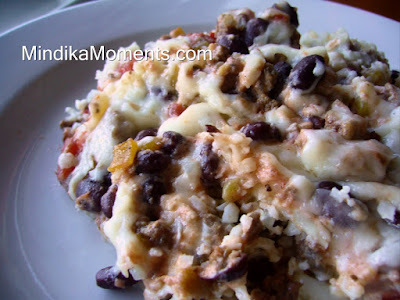 Mindika Moments: Ever heard of Cauli-Rice?? Last week a good friend of mine commented on one of my posts and mentioned that she has been serving Cauli-rice as a substitution for regular rice with her meals. I had never heard of Cauli-rice so I did a little research on-line, and asked my friend for more info. It turns out this "Cauli-rice" stuff is amazing! It's basically Cauliflower shredded to the consistency of rice and cooked dry, giving it a similar texture to rice (see recipe below). It can be used in a variety of applications while cooking. I knew I had to try it, so I came up with a simple casserole recipe to test it out. It was a huge success! We absolutely loved it. I can't say that it tasted "exactly" like rice, but it was pretty darn close and worked as an amazing substitute. Especially considering that a cup of cauli-rice has no carbs, is high in fiber and only about 20 calories, as apposed to regular rice that is loaded with carbs, and is high in calories. I will definitely be doing some more experimentation and using cauli-rice on a regular basis! Thanks Natasha!! *This recipe can easily become a vegetarian dish. Simply double the beans and leave out the beef. Season the beans exactly as you would have seasoned the beef. 1. Grate the cauliflower in a food processor or with a hand grater. You can also chop the cauliflower with a knife until it resembles small rice granules. 2. Put the grated cauliflower in a large microwave safe bowl. Do not add water and do not cover. Microwave for 5 minutes. Drain off any water. It will be very little. 3. Fluff and set aside. 4. In a large skillet, brown the ground beef, seasoning with salt & pepper. 5. Add the cumin, garlic powder and chili powder. Stir to incorporate into the meat. 6. Stir in the beans, diced tomatoes and green chilies. Then add the sour cream. 8. Bake at 350 for 30 minutes or hot and bubbly! Where can I buy this rice? Great idea and I would love to try it. I make calimashed potatoes, but this is a great idea. Thanks! Mindi - This is awesome! I love it! I can't wait to try this recipe!